The Force is going to be a whole new generation. Disney bought Lucasfilm for $4 billion and has announced that it will produce a new Star Wars trilogy, with the first one coming out in 2015. As all true fans know, George Lucas intended a nine-film series, so this may mean that his original outlines for chapters 7, 8, and 9 (or VII, VIII, and IX) are about to go into production. There were a lot of jokes today about mixing in the Star Wars characters with the Muppets, Marvel, and Mickey Mouse. But I am betting that Disney understands the value of the franchise well enough to make the next “Star Wars” more like the first “Pirates of the Caribbean” and less like “Tron: Legacy.” Or Jar-Jar Binks. One of my favorite Halloween movies for older kids is the original Poltergeist . The scares are great but what makes it work are the human characters. People often ask me if I’ve ever walked out of a movie. Fortunately, I seem to have an endless tolerance and sometimes even affection for bad movies. But just once, I did insist on leaving the theater, and a delightful tribute to William Castle’s horror movies on Turner Classic Movies reminded me of the film that did drive me from the theater. It was Castle’s 13 Ghosts . While William Castle worked with legendary Hollywood artists like George Stevens and Orson Welles, he is best remembered for his cheesy horror films, produced on micro-budgets but marketed with magna-artistry. Indeed, his marketing campaigns were far more creative than his films with fantastic gimmicks like a life insurance policy for anyone who died of fright during the film and a plastic skeleton that flew out into the audience from a wire above the screen. He even wired seats in the theater to give the audience an electric shock for The Tingler . I wrote about my favorite, for the movie Homicidal , in my new book, 101 Must-See Movie Moments . 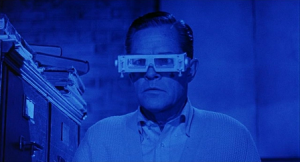 William Castle simply went nuts. He came up with “Coward’s Corner,” a yellow cardboard booth, manned by a bewildered theater employee in the lobby. When the Fright Break was announced, and you found that you couldn’t take it any more, you had to leave your seat and, in front of the entire audience, follow yellow footsteps up the aisle, bathed in a yellow light. Before you reached Coward’s Corner, you crossed yellow lines with the stenciled message: “Cowards Keep Walking.” You passed a nurse (in a yellow uniform?…I wonder), who would offer a blood-pressure test. All the while a recording was blaring, “Watch the chicken! Watch him shiver in Coward’s Corner!” As the audience howled, you had to go through one final indignity — at Coward’s Corner you were forced to sign a yellow card stating, “I am a bona fide coward.’“ Very, very few were masochistic enough to endure this. The one percent refund dribbled away to a zero percent, and I’m sure that in many cities a plant had to be paid to go through this torture. I hope not many got their money back. The surprise in the house is pretty wild! In “13 Ghosts,” a family moves into a spooky house. The gimmick is explained by Castle himself at the beginning of the film. I was so sure that the ghosts were real that I insisted my mother take me out of the theater. But now, I own the DVD, which of course came with its own ghost viewer. This week, a new film from Disney pays tribute to the early years of video games, when designers were limited to 8 bits and you had to go to the arcade and pay in quarters. “Wreck-It Ralph” is a fictional game that feels completely authentic, and the story is about what happens when Ralph gets tired of being the bad guy and visits some other games to try to become a hero. 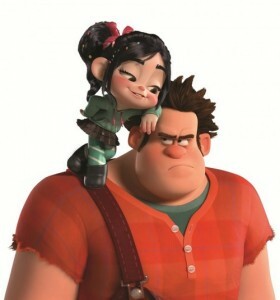 John C. Reilly plays Ralph and Sara Silverman plays a bratty little girl from another game. There are many in-jokes and appearances from classic video game characters in what has been called the “Roger Rabbit” of computer games. 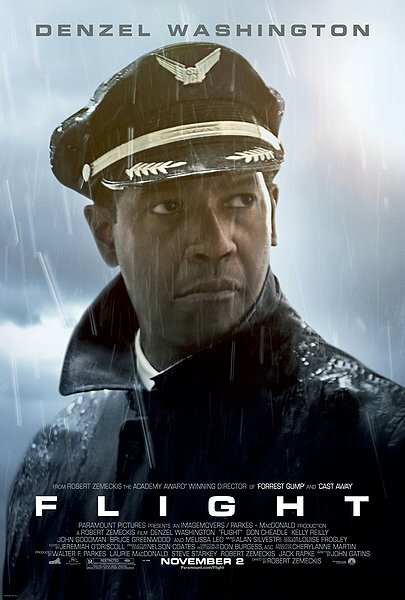 Coincidentally, the director of “Roger Rabbit” also has a movie opening up this week. Robert Zemeckis has spent the past few years making motion-capture animated films like “Mars Needs Moms,” “Disney’s A Christmas Carol,” and “Beowulf.” He’s back to live action for the first time in more than a decade with “Flight,” starring Denzel Washington as a pilot who is first acclaimed as a hero when he saves the passengers after his plane crashes, and then is the subject of an investigation. As we think about scary movies for Halloween, I wonder what the vampires in “Twilight” or “True Blood” would think of one of the earliest screen depictions of a vampire, “Nosferatu.” If the story seems familiar, it is because they wanted to film “Dracula” without paying for the rights to the original story. A great mystery grew up around the actor who played the title role, Max Schreck, inspiring the Willem Dafoe film, Shadow of the Vampire .